An array of spices at Pasad Vegan Restaurant on Saturday Nov. 10, 2018, in McAllen. McAllen — Just like hundreds of other restaurants in the Valley, at Prasad Foods, you can order just about any Mexican comfort food your heart desires. But unlike every other restaurant with similar menu items, there are no animal products in these tacos, gordas, flautas or even the parrillada. 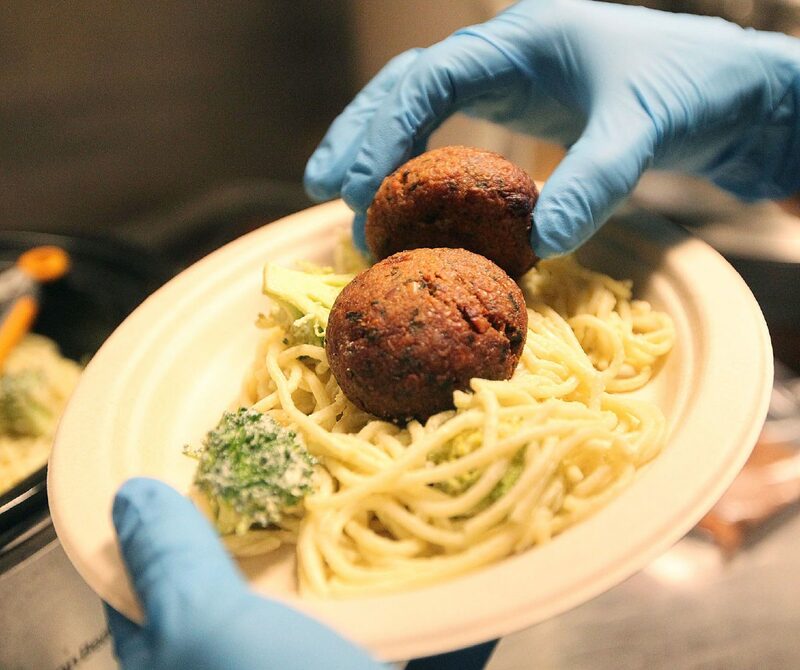 As soon as you enter the north McAllen restaurant, you’re greeted by a doormat that labels the eatery as “vegan.” In the back, Lupita Salazar and her employees make the day’s special: green spaghetti with meatballs. Everything from the mock meats to the plant-based milks are made in house. Unlike most commercial kitchens, Prasad Foods doesn’t use microwaves and they serve their meals on biodegradable disposable plates. 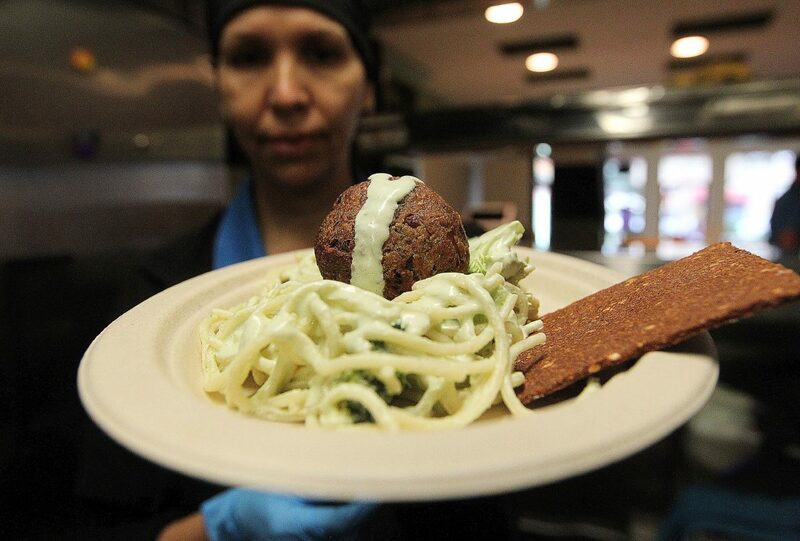 Chef Lupita Salazar with a vegan spaghetti with vegan meat balls at Pasad Vegan Restaurant on Saturday Nov. 10, 2018, in McAllen. Chef Lupita Salazar with vegan tostadas at Pasad Vegan Restaurant on Saturday Nov. 10, 2018, in McAllen. Chef Lupita Salazar holds a vegan spaghetti dish with vegan meat balls at Pasad Vegan Restaurant on Saturday Nov. 10, 2018, in McAllen. 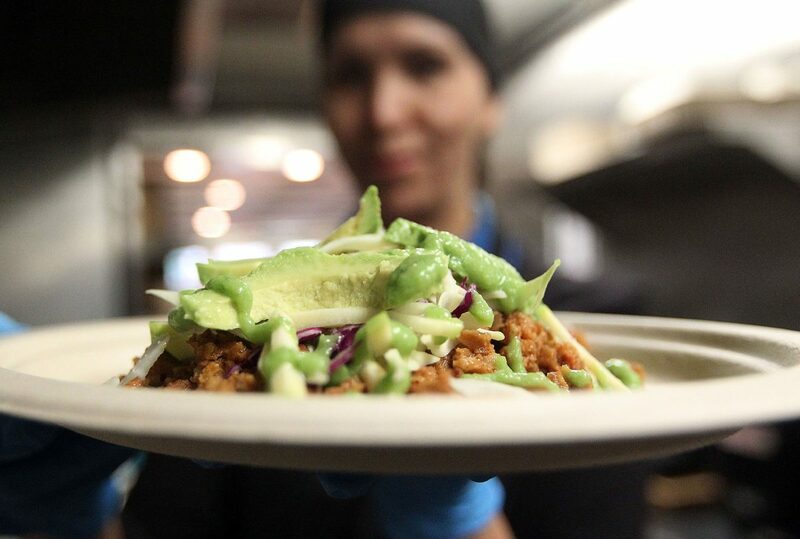 Chef Lupita Salazar prepares a vegan tostada at Pasad Vegan Restaurant on Saturday Nov. 10, 2018, in McAllen. When Salazar first started cooking vegan food nine years ago, there was no blueprint for making authentic vegan Mexican cuisine. Her and her husband, Arturo Flores, were “the pioneers for vegan food in the Valley,” Salazar said. It took them over a year to perfect their mock meat recipes, and over time her menu has been expanding. They began selling vegan meals at Major Health Foods in McAllen in 2009. In 2016, they were able to sell through a food truck, and that’s when they began to see a response from the community. Two months ago they were able to open their own location. According to Salazar, who is also a nutritionist, over 50 percent of the customers she sees aren’t actually vegan. Most are looking for healthy alternatives to the meals they already love. Unlike most nutritionists, she can encourage her patients to eat things like tacos or cake without guilt. Salazar said encouraging plant-based eating can slowly chip away at many of the health issues the region faces. According to a study by the University of Texas Rio Grande Valley, roughly 26 percent of adults in the Valley have diagnosed or undiagnosed diabetes. Related conditions like heart disease and hypertension also run high. According to a 2018 study by Harvard Medical School, those who follow a plant-based diet run a much lower risk for those diseases. Delcia Lopez is a staff photographer at the Monitor. She can be reached at dlopez@themonitor.com or (956) 683-4851.